1 Entries are for a typical temperate deciduous forest, principally managed for timber yield. 2 Drought is defined as 20 percent reduction in summer precipitation, based on an average for 10-year period. The important impacts of fire have not been considered, but risk of fire would increase dramatically under drought conditions. 3 Deforestation is assumed to be conventional felling, involving timber removal but non-removal of felling debris. 4 Introduction of earthworms into forest soils has been shown to increase the diversity of fungi in burrow walls (Tiunov & Dobrovolskaya 2002), but can also have an effect on mycorrhizal colonization and, hence, potentially fruiting bodies (Lawrence et al. 2003). ^ Dry years are typically associated with strongly negative effects on fungal fruiting bodies (e.g., see Wiklund et al. 1995). This importance of forests as sources of edible fungi differs greatly between regions. 6 Forests act as habitats for a number of food species, including deer and boar. 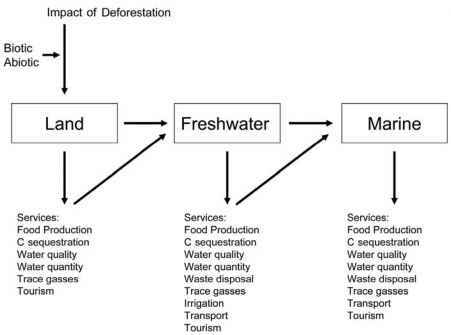 The overall impact of deforestation on these foods depends on the subsequent use of the land after deforestation, but a felled forest will generally act as a poorer service provider in this respect. 7 Experimental evidence suggests increased N mineralization and nitrification after earthworm introduction (Robinson et al. 1992). This may have local impacts on soil solution chemistry but is unlikely to have a major impact on stream chemistry. 8 Classic studies (e.g., Hubbard Brook) have clearly demonstrated the impacts of deforestation on forest streamwater chemistry. The effects are largely due to changes in deposition and hydrology, due in turn to canopy removal and to the dramatic switches in physical status of soil that impacts decomposition rates. 9 In the laboratory, increased growth of tree seedlings has been demonstrated as a result of earthworm addition (Haimi & Einbork 1992). 10 Decreased NPP with drought, with slower growth. Timber quality may actually improve, however. Mycorrhizal fungi may play a significant role in forest drought resistance (Garbaye 2000). 11 Only the provision of wood is considered. 12 Current role of temperate forests as sources of biochemicals and medicines is limited in temperate regions. However, future potential and nontemperate forest use cannot be totally ignored and the loss of even one plant species may be of importance. 13 Habitat provision for high-visibility/threatened species. 14 Changes in understory vegetation may occur as a consequence of drought. Reductions in understory density may reduce value as a habitat. ^Deforestation may have a range of impacts on small and large mammal, bird, and invertebrate populations. 16Production forest has been evaluated as disposal sites for sewage sludge (Ferrier et al. 1996); the disposal process depends heavily on the activities of soil biota. Production forest is also a suitable land use for revegetated mine wastes. 17 Interaction not investigated, but evidence suggests that earthworms may help break down waste. Reclamation engineers use the viability of earthworms as an index of soil condition. 18 Shortage of water would have the direct physical effect of decreased dilution of wastes, while limitation to microbial activity could lead to decreased degradation. 19 Increased channel bypass flow and decreased interaction time between water and soil would reduce ability to deal with certain pollutants (Bardgett et al. 2002). 20 Refers to biological control of parasites and diseases of natural species. 21 Strong interactions between site management and root pathogens with drought have potentially beneficial effects, whereas untreated stumps after felling may act as sources of root pathogen inoculum (Thies 2001). 22 Tree species and planting density have a major affect on recreational use of forests, for both hikers and hunters. 23 Trace gas consumption by forests depends on water status, species, management and, in particular, extent of fertilizer addition (Ineson et al. 1991). 24 Associated with increased N mineralization and earthworm casts (Elliott et al. 1991). Soil water content has a major effect on methane transfers in soils, with optimum contents for methane oxidation and nitrous oxide production (Del Grosso et al. 2000). Both drought and deforestation have marked effects on these fluxes. 26 Earthworms contribute to soil structure through bioturbation and redistribute organic materials over a large vertical range in the soil profile; however, as invasives they displace enchytraeids and microarthropods that are also critical for soil structure and development.